Convent is to cloister as eyrie is to what? But why? Let’s find out. If we look up the definitions of “convent”, “cloister” and “eyrie”, we will find some with a strict sense and some with a relaxed colloquial sense. Also the meaning of these words has changed a little over time. Convent: A convent is usually a building used by a community of priests, nuns, or religious brothers or sisters. Cloister: Architectural meaning – a cloister is a covered columned walkway surrounding a courtyard in the center of a convent (monastery). Etymological interpretation is that a cloister (from Latin claustrum, a place shut in) is a place of religious seclusion, and that it is synonymous to a convent or monastery. Other meanings include: monastic establishment, area within a convent (monastery) to which the religious are restricted, monastic life, a place or state of seclusion. Today the word “convent” or “cloister” tends to be used to refer to communities of women, and “monastery” – to communities of men. Eyrie: One definition is that an eyrie is a lofty nest of an eagle/hawk or other bird of prey, perched in a high vantage point, such as a tall tree or cliff. Another definition is that an eyrie is any habitation built at a high altitude or in a high place. Eyrie is variant of aerie, presumably “nest” in Latin. In The Hobbit, Thorondor (Lord of Eagles) kept his eyries at the top of Thangorodrim, the volcano above Angband. Nest: A nest is a structure built by a bird as a habitat to incubate eggs and rear young. 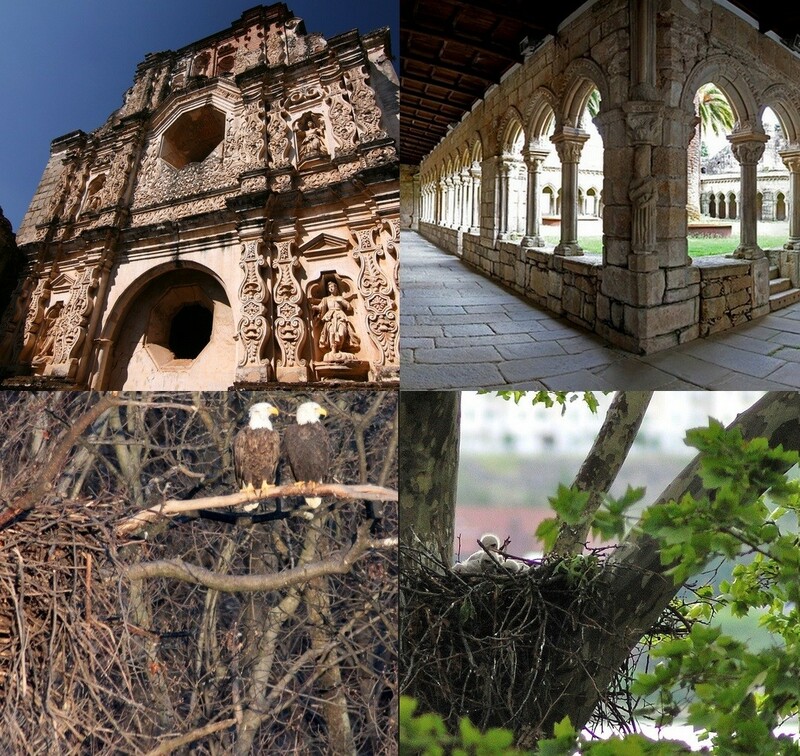 So, the cloister is [the center of a] convent, and the nest is [the center of an] eyrie. You are welcome to try to answer these in the comment section below.